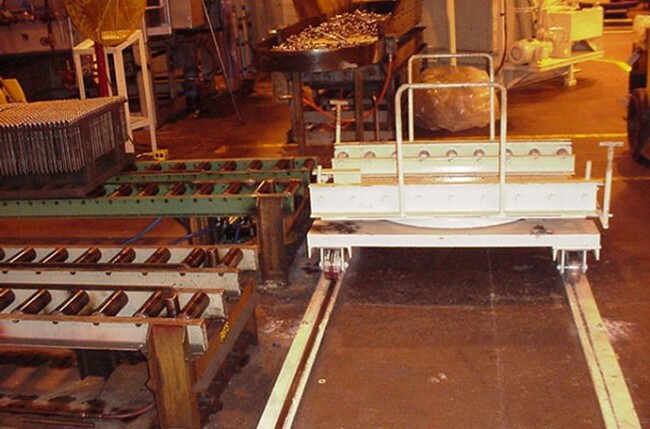 Provide a safe, ergonomic, and yet cost-effective way to transport automotive tie rods from the exit conveyor of the heat treating process to an existing out-going conveyor on the opposite side of the department without major equipment rearrangements. With space constraints, ergonomic issues, and production times in mind, our team designed a parts transfer cart that consisted of floor-mounted v-track casters, rotating turntable, and mechanically activated stops and safety latches to transfer large volumes of parts in a fixture container from the first operation to the next. Total project cost = $15K.